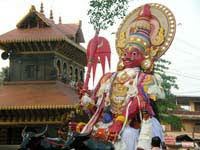 The temple festival held on the Bharani Nakshatra day in Malayalam Kumbham Month at Chettikulangara Temple in Kerala is famous for its unique rituals like the Kuthiyottam and Kettukazhcha. Chettikulangara Kumbha Bharani 2019 date is March 11, Monday. Chettikulangara Bhagavathy Temple is located near Kayamkulam in Alleppey District in Kerala. The temple is dedicated to Goddess Shakti and is considered highly powerful. It is also one of the richest temples in Kerala. The highlight of the Kumbha Bharani Festival is the display of huge decorated forms of temple cars known as ‘Kuthiras.’ Therus (Chariots) and two huge idols of Bhima and Hanuman complete the Kettukazhcha which is a visual spectacle which attracts people from different parts of India and around the world. 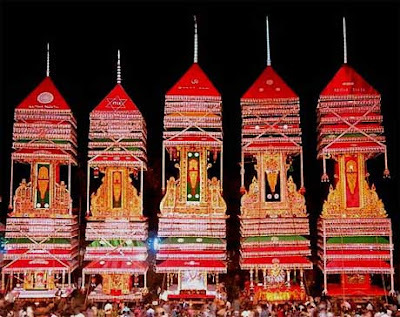 The temple cars are as high as three-storied buildings (70 to 75 feet) and are pulled to the Temple grounds by the people of the respective villages from late afternoon on Kumbha Bharani day. Late at night Goddess Bhagavathi visits each of the Kettukazhcha. Another highlight is a temporary market that comes during the period which sells local farm products. In the morning, young boys between 8 to 14 years perform the ritual Kuthiyottam. The boys are taught and perform the ritual in houses that are offering Kuthiyottam to temple. The Chettikulangara Temple is located on the Kayamkulam – Mavelikara road and is around 4 km from Kayamkulam.